So this time of year is great for sales! Summer is in full swing and you’ve just got to catch these deals before they’re gone! Proenza Schouler, Rag & Bone, and even a pair of those fabulous Dolce & Gabbana headphones from the line that Rihanna was wearing earlier this year! And, starting tomorrow add an extra 20% off on all ModaOperandi sale items with the code MODA20. Last weekend I got plenty of sun in the nearly 100 degree weather at the Montauk Beach House. Michelle Smith showed her Milly Resort 2014 Collection in a beautiful fashion presentation by the pool, part of a summer-long music and fashion series hosted by the Montauk Beach House. It was an absolutely gorgeous day and last weekend, I was on the beach or by the pool for 80% of the time! 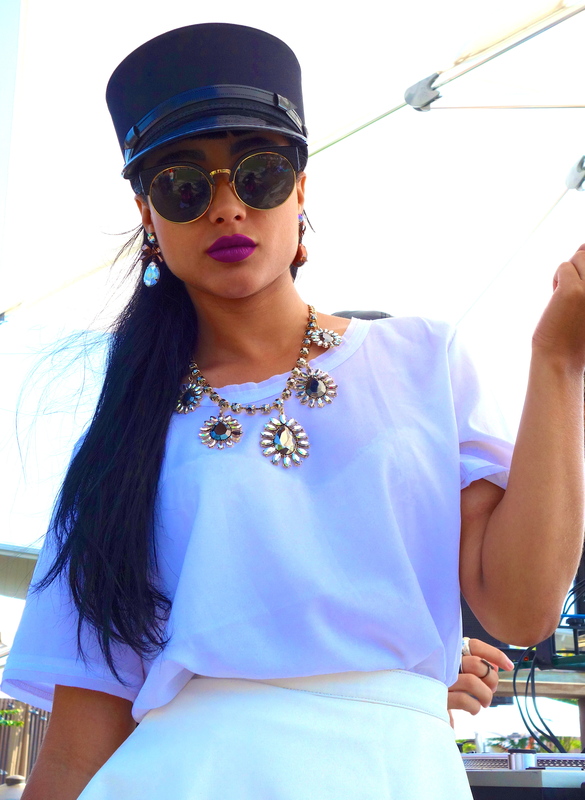 Singer-songwriter Natalia Kills performed and we enjoyed great drinks and music all Saturday afternoon. I just loved the bright, bold colors in the collection, not to mention that much of it looked really comfortable. Artwork seemed to influence Milly as some of the fabric seemed painted like that on the model above. Crop tops kept cropping up in Milly’s Resort 2014 Collection as well. I don’t think they’re going anywhere. I wore a pink neon Eres itty-bitty bikini along with an exclusive purple hat from couture milliner Ellen Christine’s Spring 2014 Collection. By the way, if you want a couture hat of your own, she’s giving a 10% discount to blog readers. Just call her showroom and mention the blog. 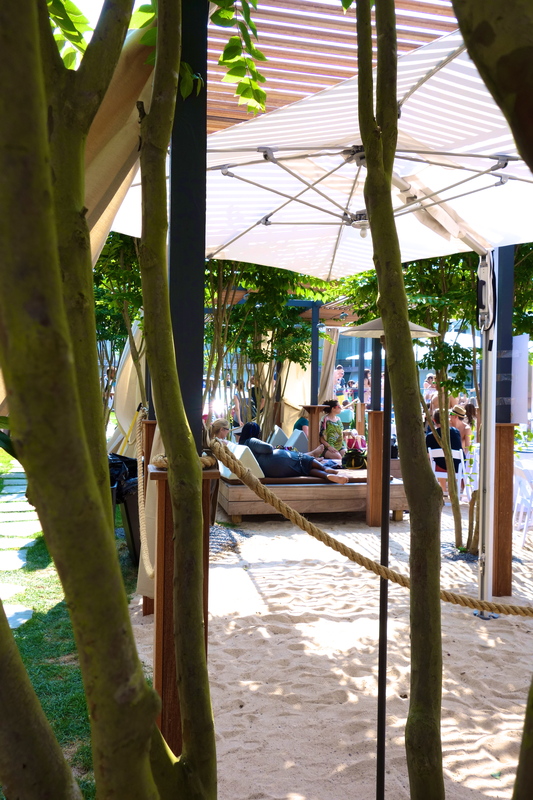 While there I met a few from the Milly team, spotted some great poolside fashion and ran into Cannon Hodge of Bergdorf Goodman. She and her friend were wearing amazing kaftans from Camilla Franks that should be available at Bergdorfs in a few months. She showed me that this particular kaftan could be tied multiple ways for a causal or dressy look. Looks like it will be available soon at BG for about $500 or so. Milly’s collection isn’t quite available yet but for some of the looks here, check out my Summer is in the Air Collection or Shopbop’s Best of Summer 2013 .